In the wake of the state Senate’s disappointing passage of House Bill 1237 yesterday, we have started a social media campaign to let the bill’s prime sponsor, Rep. Jon Hansen, know how much we pro-choice activists disagree with his intrusion into our personal lives and reproductive freedom. The weekend is nearly here, so we know that the brains of women all across the state of South Dakota are about to shutdown, not to think another thought until business hours resume on Monday. But since Rep. Hansen pretends to care so much for women, and since he is clearly the legislative expert on women’s reproductive health, why not ask him to help you with the questions that you will be unable to answer for yourself this weekend? Thinking on the weekends is hard (near impossible!) for women. 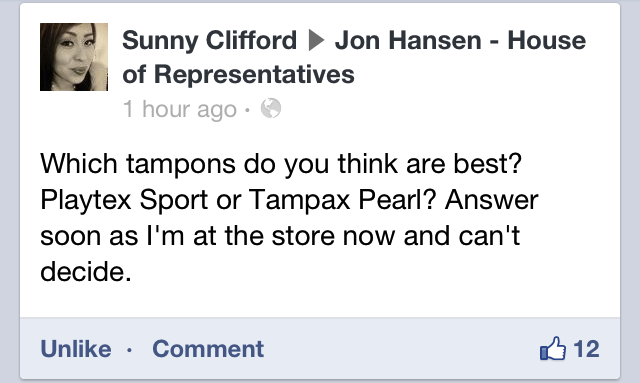 Rep. Hansen is here to help. 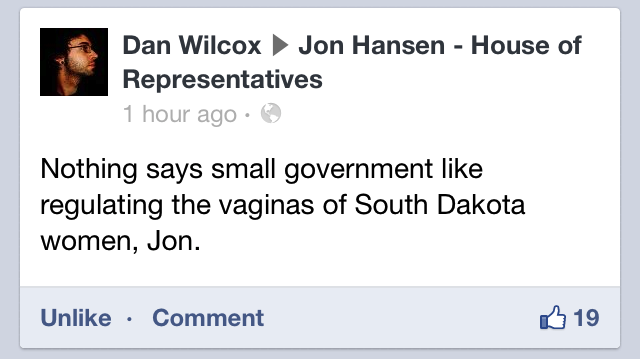 You can find Rep. Hansen’s campaign page on Facebook here. This entry was posted in Uncategorized and tagged HB1237, NARAL, prochoice, weekends by naralsd. Bookmark the permalink.